The Orion Orchestra, conductor Toby Purser, is celebrating 2015 the Year of Mexico in the UK with an imaginative audio-visual concert at the Queen Elizabeth Hall on 30 June 2015, when they will be giving the world premiere of Mexican composer Federico Gonzalez Orduña's Piano Concerto with the work's dedicatee, Raul Jimenez, as soloist. Also in the programme will be music from both Mexico and from the UK, by Chávez, Márquez, Moncayo, RVW and Thomas Ades. Thomas Adès' Polaris will be performed with video projections specially designed by BAFTA-award winning artist Tal Rosner, and Danzón No. 2 by Arturo Márquez will be accompanied by projections of photography inspired by the music, and taken by visually impaired and blind Mexican artists, with the support of the charity Ojos que Sienten. 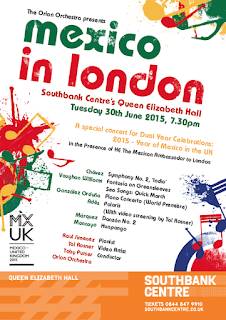 The event promises to be a fascinating mix of British and Mexican cultures, with both aural and visual stimulus, all energised by the lively playing from the young players of the Orion Orchestra. Further information and tickets from the South Bank website.